Announced only a few days ago, the Doernbecher Freestyle has graced us with 6 collaborative colorways that tap into the hospital’s many unique patients. Each with their own story, the Beaverton brand is now looking at Alden Barber, tapping into his confounding bravery to completely overhaul the Air Max 270. 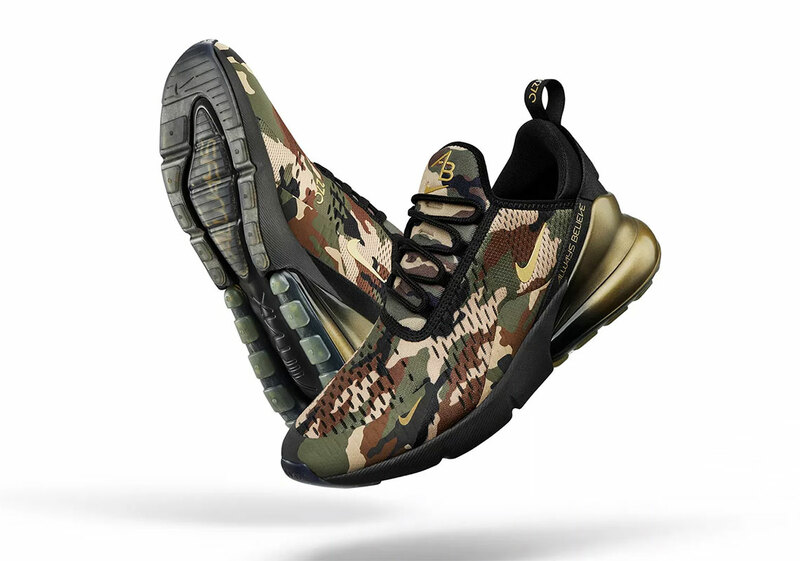 Luxe in its finishing alongside hits of militaristic aesthetics, the silhouette bears a classic camouflage upper with an iconically large air bubble brushed in a gold gradient. Many subtle details call back to Barber’s experience and the family that has supported him, bearing AB along the tongue and heel — which are both his and his elder sister’s initials — while also featuring his inspiring motto: “Always Believe.” Printed along the insoles is a fitting graphic that embodies Barber’s brain and the titanium plates that now reside in it, marking the long journey that began from the young boy’s diagnosis back in 2015. Retailing at $150 USD, the “Doernbecher Freestyle” Air Max 270 will be available at nike.com on December 14th.